Over the past fifty years, America’s environmental movement has grown from college kids adorning flowers to a billion dollar industry. With huge budgets to employ lobbyists, lawyers, and public relations professionals, many of America’s leading environmental non-profits are unrecognizable from their modest beginnings. What may seem like an organic, disparate movement is actually a well oiled machine that receives its funding from a handful of super rich liberal donors operating behind the anonymity of foundations and charities, according to a new report out today by the Committee on Environment and Public Works (EPW). 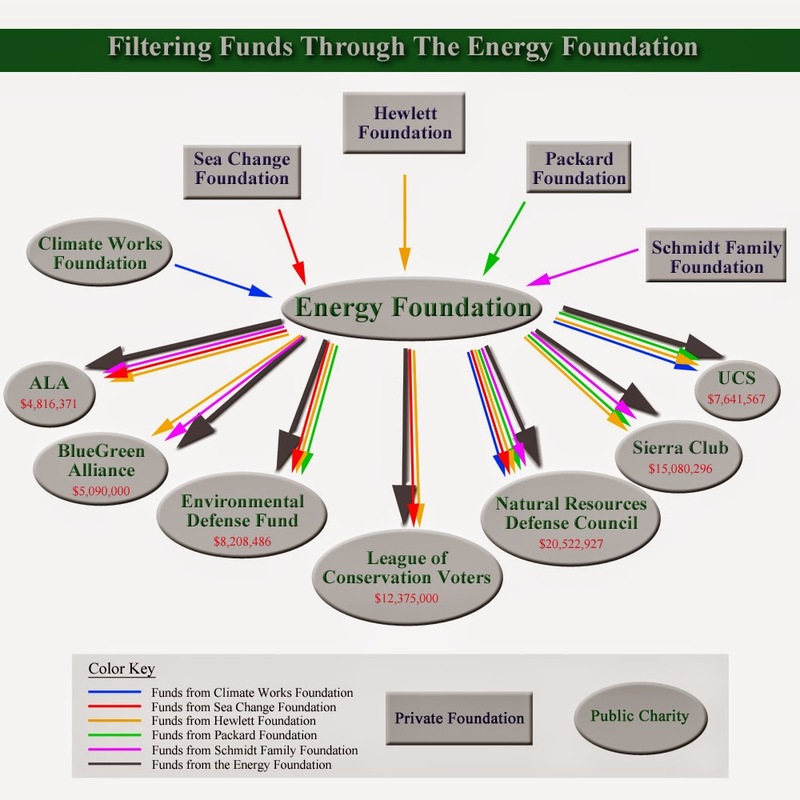 The network funnels money from “charitable” foundations, often through 501(c)(3) “educational” nonprofit groups, to activist organizations that attempt to influence legislation, elections, regulatory actions, or public perception on major environmental issues. The [Billionaire Club’s] activities are frequently shielded from public scrutiny due to their use of non-profit tax designations that do not require the public disclosure of donors. What EPW’s report shows is the environmental movement is following the very model President Obama criticized, manipulating the tax code in the process, with no repercussion from the IRS. The Committee has uncovered evidence that proves President Obama and his EPA are pivotal partners in the far-left environmental movement. The Agency’s leadership under President Obama is closely connected with the Billionaire’s Club and their network of activists. Unfortunately, in the last four years, the ESA has become the basis for an explosion of lawsuits seeking to force hundreds of new species listings. Many of these suits are funded at taxpayers’ expense, which in turn require federal, state and local agencies to spend even more taxpayer money to respond.
. . . the government literally pays people to sue it. The costs add up, too. The Interior Department paid out more than $21 million in attorneys' fees to outside groups engaged in ESA cases between 2001 and 2010, according to a 2012 Government Accountability Office study. Environmental groups I spoke with said the rates need to be somewhat comparable to what corporate attorneys get paid for the same work. "Rates for big law partners in major cities can be insanely high (like $850/hour), and we've always tried to stay in the reasonable range," said John Buse, legal director for the Center for Biological Diversity. So charging taxpayers as much as $400 an hour is really a bargain, if you think about it. Even in cases where the litigation is done in-house, the groups sometimes charge similar rates. "Our lawyers need to get paid for their time," said Ya-Wei Li, an attorney with Defenders of Wildlife. You don't often get environmentalists citing Big Business' policies as a model to follow, but they will make an exception when it comes to getting money from the government. The article goes further in depth with the problem. From this perspective, legal victories that pro-land use organizations such as Blue Ribbon Coalition, The Trail PAC, California Association of 4WD Clubs, United Four Wheel Drive Associations, Off Road Business Association, California Off-Road Vehicle Association, Pacific Legal Foundation, and others have achieved with such miniscule legal budgets are amazing. Many of their attorneys work pro bono. The difference in goals between these true environmental organizations and the faux environmental organizations is clear when you look at the money involved: the pro-access organizations focus on protecting the environment and keeping public lands open to the public, while the anti-access organizations focus on wielding junk science as leverage to collect huge settlements of taxpayer dollars. The "environmental" movement is big business, but there are still real environmentalists out there who are more concerned with fighting to preserve and protect our backcountry areas for everyone to enjoy. America’s environmental agenda is set by elite foundations that decide which activists get the money. And they form “affinity groups” to collude with President Obama’s bureaucracy, which funnels tax dollars to Democratic advocates to enforce that agenda. As a mere peon to our corrupt government officials, you may be feeling helpless - but you can still make an impact! Keep voting for politicians such as Tom McClintock who actually represent your interests, and provide some financial support to the organizations listed above who are organized and putting up a strong fight to keep public lands open to the public.